The Messerschmitt Bf 109 was the workhorse of the German Luftwaffe in World War Two. Produced in large numbers and in many variants, it saw service from the Spanish Civil War (1936-39) through the end of WW II and during the first conflict in the Middle-East between Israel and Egypt in 1948-49. The most produced variant was the G-6, with its gun bulges in front of the cockpit. Later rather than designing a whole new airframe, these were converted to G-10 and K models. In 2003, the Museum was able to identify a mysterious wood instrument panel in its collection. It was painted black on one side and dark grey on the other with no instruments mounted. 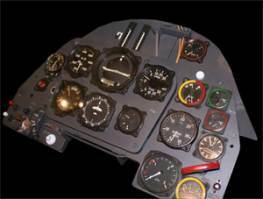 A review of collections records found that this was, in fact, an authentic Bf 109 instrument panel that had been painted black at some time. Museum volunteers repainted it with the historically correct RLM 66 Dark Grey, the same color as the original paint still showing on the back of the panel. Fortunately, the Museum was able to collect more than half the original instruments from its enormous collection of aircraft instruments. Replica instruments were fabricated by Curatorial volunteer John Randle and staff graphic artist Sam Holeman. Randle also fabricated the Revi gunsight and hand painted the bezels of the engine instruments, as done on the originals to attract the pilot's eye to the most critical instruments. Finally, after meticulous research, the staff was able to confirm that the instrument panel was from a late model Bf 109K. The project took over approximately three months to complete. The instrumental panel is now on display, alongside an authentic Bf 109 control column and hand grip, in the British Eagle Squadron Ready Room in the World War II Gallery.